The Odrysian Kingdom (/oʊˈdrɪʒən/; Ancient Greek: Βασίλειον Ὀδρυσῶν; Latin: Regnum Odrysium) was a state union of over 40 Thracian tribes and 22 kingdoms that existed between the 5th century BC and the 1st century AD. It consisted mainly of present-day Bulgaria, spreading to parts of Southeastern Romania (Northern Dobruja), parts of Northern Greece and parts of modern-day European Turkey. It is suggested that the kingdom had no capital. Instead, the kings may have moved between residences. A capital was the city of Odryssa (assumed to be Uscudama, modern Edirne), as inscribed on coins. Another royal residence believed to have been constructed by Cotys I (383-358 BC) is in the village of Starosel, while in 315 BC Seuthopolis was built as a capital. An early capital was Vize. The kingdom broke up and Kabyle was a co-capital by the end of the 4th century BC. The Odrysians (Odrysae or Odrusai, Ancient Greek: Ὀδρύσαι) were one of the most powerful Thracian tribes that dwelled in the plain of the Hebrus river. This would place the tribe in the modern border area between Southeastern Bulgaria, Northeastern Greece and European Turkey, centered around the city of Edirne. The river Artescus passed through their land as well. Xenophon writes that the Odrysians held horse races and drank large amounts of wine after the burial of their dead warriors. Thucydides writes on their custom, practised by most Thracians, of giving gifts for getting things done, which was refuted by Heraclides. Herodotus was the first writer to mention the Odrysae. Silver Diobol of the Thracian king Kotys I, Odrysian kingdom, 384-359 B.C. Thrace had been part of the Persian empire since 516 BC during the rule of Darius the Great, and was re-subjugated by Mardonius in 492 BC. During Persian rule, it made part of the Skudra satrapy (province). Parts were occupied by Scythians and Greek colonists earlier besides the numerous later invasions. 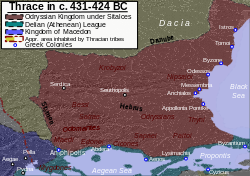 The Odrysian state was the first Thracian kingdom that acquired power in the region, by the unification of many Thracian tribes under a single ruler, King Teres, probably in the 470s BC after the Persian defeat in Greece. Initially, during the reign of Teres or Sitalces the state was at its zenith and extended from the Black Sea to the east, Danube to the north, the region populated with the tribe called Triballi to the north-west, and the basin of the river Strymon to the south-west and towards the Aegean - present-day Bulgaria, Romanian Dobruja, Turkish East Thrace and Greek Western Thrace between the Hebrus and the Strymon, except the Aegean and Black seas coasts mostly occupied by Greek cities. Sovereignty was never exercised over all of its lands as it varied in relation to tribal politics. This large territory was populated with a number of Thracian and Daco-Moesian tribes that united under the reign of a common ruler, and began to implement common internal and external policies. These were favorable conditions for overcoming the tribal divisions, which could lead gradually to the formation of a more stable ethnic community. This was not realised and the period of power of the Odrysian kingdom was brief. Despite the attempts of the Odrysian kings to bolster their central power, the separatist tendencies were very strong. Odrysian military strength was based on intra-tribal elites making the kingdom prone to fragmentation. Some tribes were rioting constantly and tried to separate, while others remained outside the borders of the kingdom. At the end of the 5th and the beginning of the 4th century BC, as a result of conflicts, the Odrysian kingdom split into three parts. The political and military decline continued, while Macedonia was rising as a dangerous and ambitious neighbour. According to the Greek historians Herodotus and Thucydides, a royal dynasty emerged from among the Odrysian tribe in Thrace around the end of the 5th century BC, which came to dominate much of the area and peoples between the Danube and the Aegean for the next century. Later writers, royal coin issues, and inscriptions indicate the survival of this dynasty into the early 1st century AD, although its overt political influence declined progressively first under Persian, Macedonian, later Roman, encroachment. Despite their demise, the period of Odrysian rule was of decisive importance for the future character of south-eastern Europe, under the Roman Empire and beyond. Teres' son, Sitalces, proved to be a good military leader, forcing the tribes that defected the alliance to acknowledge his sovereignty. The rich state that spread from the Danube to the Aegean built roads to develop trade and built a powerful army. In 429 BC, Sitalces allied himself with the Athenians and organized a massive campaign against the Macedonians, with a vast army from independent Thracian and Paeonian tribes. According to Thucydides, it included as many as 150,000 men, but was obliged to retire through the failure of provisions, and the coming winter. Greek as a lingua franca had been spoken at least by some members of the royal household in the fifth century and became the language of administrators; the Greek alphabet was adopted for a new Thracian script. After the kingdom had split itself in three semi-independent kingdoms Philip II of Macedon invaded and conquered much of Thrace. Some Odrysian kings and other Thracian tribes were submitted and paid taxes at times during different periods to Philip II, Alexander the Great and Philip V. Two of the three kingdoms were forced into vassal status by Philip II in 352 BC, while in 342-341 BC he conquered the Odrysian heartland deposing reigning kings or rebelled vassals. Nevertheless, Seuthes III (341-300 BC) had survived the expansion of Philip, maintaining continuity of the kingdom probably only as a client on a power-sharing basis with the appointed Macedonian satrap of Thrace Lysimachus in 323 BC. But Seuthes had warred often against Lysimachus and set the capital at Seuthopolis from 320 BC until it was sacked by the Celts in 281 BC. By 212 BC an army led by an Odrysian king Pleuratus destroyed the Celtic kingdom and its capital Tylis. The Odrysian kingdom had maintained continuity with its own kings, but broken up into several kingdoms (including Canite and Odrissae) by the early second century BC, until succumbing to complete Roman conquest in 146 BC. In 100 BC a Thracian kingdom was restored, possibly by a son of Beithys, one of the last kings of the Odrissae, it is not clear if it was a vassal of Rome or entirely independent. Several years later, some Thracians and Celts overran the southern Balkans, Epirus, Dalmatia and northern Greece, and penetrated the Peloponnese. A kingdom of another Odrysian bloodline had re-emerged in 55 BC (Sapei) and by 30 BC it conquered or otherwise controlled the other Odrysian kingdom (Antaea), although it, along with[clarification needed] other Thracian tribes, became a Roman proxy soon afterward. By 11 BC, the uncle of the Roman emperor Augustus was the Odrysian king, easing the gradual Romanization of the region. The Odrysian king was murdered by his wife and his kingdom was completely subjected to Rome in 46 AD. Odrysian crafts and metalworking are largely a product of Persian influence. Thracians as Dacians and Illyrians all decorated themselves with status-enhancing tattoos. Thracian warfare was affected also by Celts and the Triballi had adopted Celtic equipment. Thracian clothing is regarded for its quality and texture and was made up of hemp, flax or wool. Their clothing resembled that of the Scythians including jackets with colored edges, pointed shoes and the Getai tribe were so similar to the Scythians that they were often confused with them. The nobility and some soldiers wore caps. There was a mutual influence between the Greeks and the Thracians. Greek customs and fashions contributed to the recasting of east Balkan society. Among the nobility Greek fashions in dress, ornament and military equipment were popular. Unlike the Greeks, the Thracians often wore trousers. Thracian kings were subjected to Hellenization. Residences and temples of the Odrysian kingdom have been found, particularly around Starosel in the Sredna Gora mountains. Archaeologists have uncovered the northeastern wall of the Thracian kings' residence, 13 m in length and preserved up to 2 m in height. They also found the names of Cleobulus and Anaxandros, Philip II of Macedon's generals who led the assault on the Odrysian kingdom. ^ a b c "Welcome to the SiteMaker Transition Project - Sitemaker Replacement Project" (PDF). sitemaker.umich.edu. ^ a b c d e Thrace. The History Files. ^ "Interview: Capital of largest Thracian kingdom discovered in Bulgaria". xinhuanet.com. Archived from the original on 2017-02-04. Retrieved 2016-05-26. ^ Borza, Eugene (1992). In the Shadow of Olympus: The Emergence of Macedon. Princeton University Press. ISBN 0-691-00880-9. ^ Faudot, Murielle (2005-01-01). Pont-Euxin Et Polis. ISBN 9782848671062. ^ Chudnoff, Yoav. "Kabile: When One is Curious". ^ Harry Thurston Peck, Harpers Dictionary of Classical Antiquities (1898),"(Odrusai). The most powerful people in Thrace, dwelling in the plain of the Hebrus, whose king, Sitalces, in the time of the Peloponnesian War, exercised dominion over almost the whole of Thrace. (See Thracia.) The poets often use the adjective Odrysius in the general sense of Thracicus." ^ John Boardman; I. E. S. Edwards; E. Sollberger; N. G. L. Hammond (1992). The Cambridge Ancient History. 3. Cambridge University Press. p. 605. ISBN 978-0-521-22717-9. ^ Herodotus, The Histories (ed. A. D. Godley),4.92.1,"XCII. From there, Darius set out and came to another river called Artescus, which flows through the country of the Odrysae; and having reached this river, he pointed out a spot to the army, and told every man to lay one stone as he passed in this spot that he pointed out. After his army did this, he led it away, leaving behind there great piles of stones." ^ Xenophon, Hellenica, 3.2.1, But when the Odrysians returned, they first buried their dead, drank a great deal of wine in their honour, and held a horse-race; and then, from that time on making common camp with the Greeks, they continued to plunder Bithynia and lay it waste with fire. ^ The History of the Peloponnesian War By Thucydides,"For there was here established a custom opposite to that prevailing in the Persian kingdom, namely, of taking rather than giving; more disgrace being attached to not giving when asked than to asking and being refused; and although this prevailed elsewhere in Thrace, it was practised most extensively among the powerful Odrysians, it being impossible to get anything done without a present". ^ The Oxford Classical Dictionary by Simon Hornblower and Antony Spawforth, ISBN 0-19-860641-9,"page 1515,"The Thracians were subdued by the Persians by 516"
^ Readings in Greek History: Sources and Interpretations by D. Brendan Nagle and Stanley M. Burstein, ISBN 0-19-517825-4, 2006, page 230: "... , however, one of the Thracian tribes, the Odrysians, succeeded in unifying the Thracians and creating a powerful state ..."
^ The Oxford Classical Dictionary by Simon Hornblower and Antony Spawforth, ISBN 0-19-860641-9, page 1515,"Shortly afterwards the first King of the Odrysae, Teres attempted to carve an empire out of the territory occupied by the Thracian tribes (Thuc.2.29 and his sovereignty extended as far as the Euxine and the Hellespont)"
^ Xenophon (2005-09-08). The Expedition of Cyrus. ISBN 978-0-19-160504-8. Retrieved 24 December 2014. ^ D. M. Lewis; John Boardman; Simon Hornblower (1994). The Cambridge Ancient History. Cambridge University Press. p. 444. ISBN 978-0-521-23348-4. ^ The Oxford Classical Dictionary by Simon Hornblower and Antony Spawforth, ISBN 0-19-860641-9, page 1514, "the kingdom of the Odrysae the leading tribe of Thrace extented ver present-day Bulgaria, Turkish Thrace (east of the Hebrus) and Greece between the Hebrus and Strymon except for the coastal strip with its Greek cities"
^ Lysimachus: A Study in Early Hellenistic Kingship by Dr Helen S Lun, page 19, "... Profiting from dynastic rivalries which had split the powerful Odrysian kingdom into three realms, in 341 BC Philip II finally ..."
^ Fol, Alexander. Demographic and Social Structure of Ancient Thrace. ^ The Oxford Classical Dictionary by Simon Hornblower and Antony Spawforth, ISBN 0-19-860641-9, page 1515, "Sitalces allied himself with the Athenians against the Macedonians"
^ Thucydides. History of the Peloponnesian War, ii. 98. 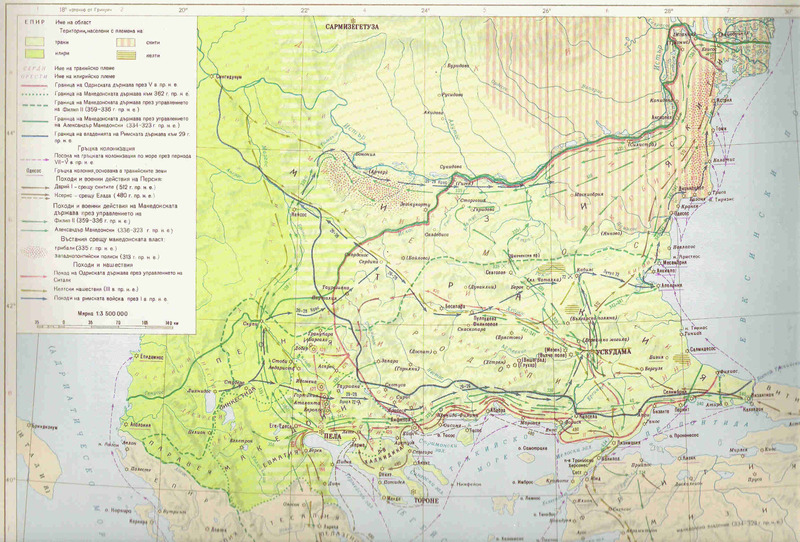 ^ Kessler, P L. "Kingdoms of Greece - Macedonians". www.historyfiles.co.uk. ^ a b Kessler, P L. "Kingdoms of Greece - Sapes (Thrace)". www.historyfiles.co.uk. ^ Bosworth. Conquest and Empire: The Reign of Alexander the Great. Cambridge University Press. p. 12. ^ "Bulgarian Archaeologists Make Breakthrough in Ancient Thrace Tomb". Novinite. 11 March 2010. Retrieved 3 April 2010. ^ a b "Bulgarian Archaeologists Uncover Story of Ancient Thracians' War with Philip II of Macedon". Novinite.com (Sofia News Agency). 21 June 2011. Retrieved 24 June 2011. Map of the Odrysian kingdom in 5th century BC – (borders in red).